A new integrated plasterboard ceiling system with superior acoustics. Architects, interior designers and their clients often look for clean, seamless ceiling finishes for impressive public spaces, but acoustical ceiling solutions with a smooth plasterboard appearance have traditionally been costly to install. 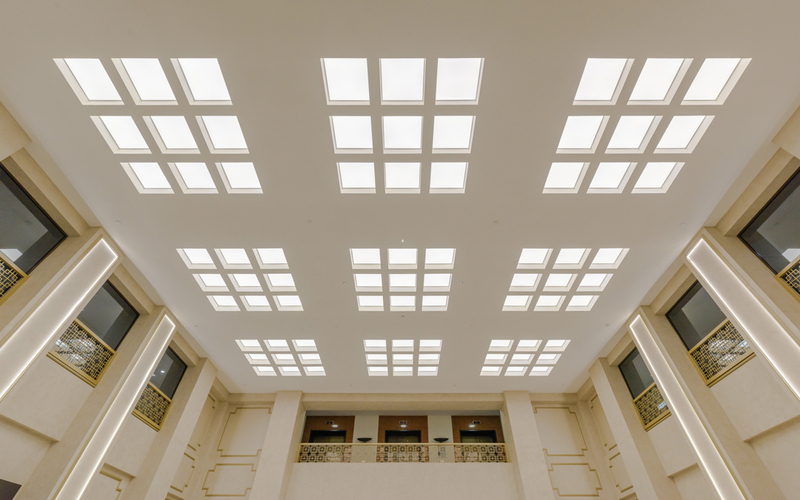 USG Boral’s Ensemble acoustical plasterboard ceiling system offers clean, elegant aesthetics with outstanding sound performance in a cost-effective solution. Ideal for lobbies, atriums, galleries, educational buildings and other spaces with ultiple hard surfaces and ambient noise, Ensemble is a sound choice. One of Perth CBD’s most impressive buildings, National Trust-classified Chancery House was constructed in the late 1920s. 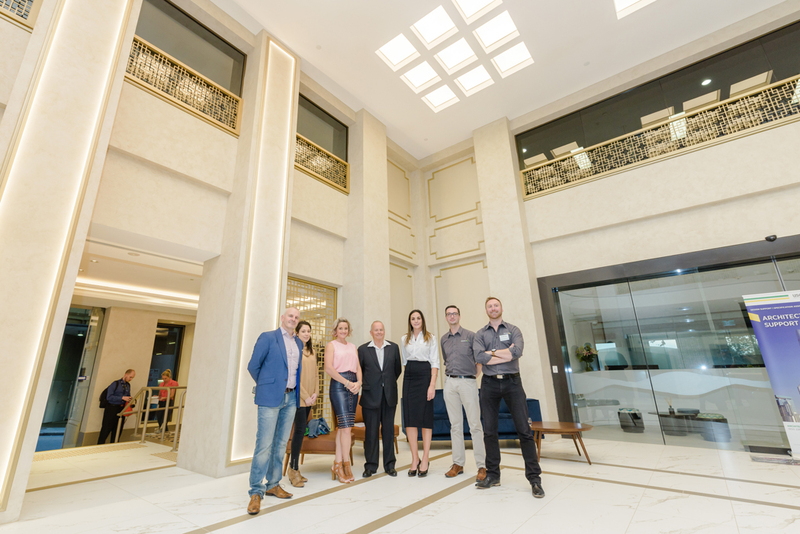 During 2017, the ground floor with its magnificent marble floor and atrium skylight was renovated to create an imposing foyer for office tenants and visitors. Heritage listing puts restrictions on altering a building’s interior as well as its exterior. This presented a challenge, as acoustic ceiling products typically have a “modern” perforated tile look. Roger Gregson of Oldfield Knott Architects says, “We were looking for an acoustic ceiling material for this project, but it had to have the uniform appearance of a heritage ceiling. Once USG Boral showed us the possibilities of the Ensemble system, we realized the entire surface had the necessary acoustic properties. We could then apply a finished product over everything that’s up there to make it uniform and achieve the monolithic look we were aiming for. Ensemble fitted the bill perfectly. “To get a monolithic ceiling looking like that, and it’s also acoustic – we are very, very pleased with it,” says Gregson. The refurbishment had to take place over the Christmas period when the building could be closed, which made the Ensemble six-step installation process preferable to comparable systems that can involve 10 to 14 steps. 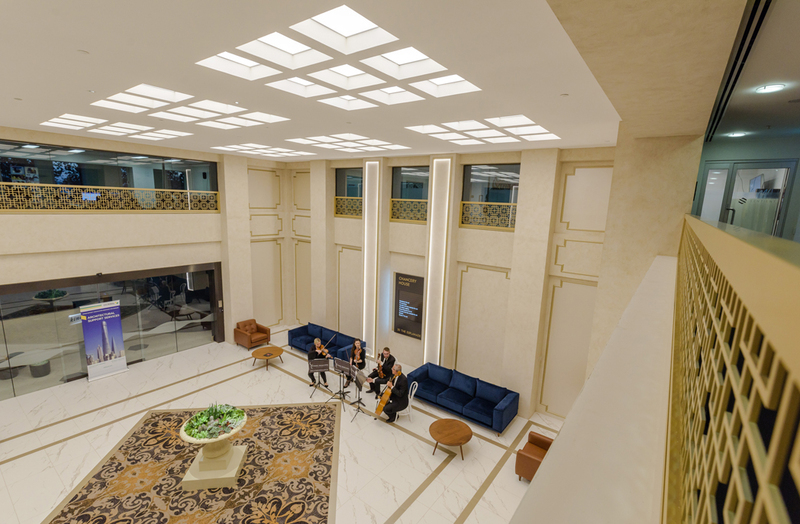 Michael Goldschlager of String Musicians Australia, who played at Ensemble’s Chancery House launch, was surprised by the acoustics of the foyer, given its marble floor and lofty central atrium. “In a space like this you would expect all sorts of problems with reverberation and it seemed to just drink it up in an appropriate way and leave just enough for warmth. I’ve played all the great halls of the world … it does it just beautifully,” says Goldschlager.